BRIGHTON, Mich. - Attention all Ford lovers: the 2014 Ford Fiesta ST has finally arrived in the U.S.! While this vehicle has been available in Europe for a couple of decades now, it will be the first time that this car will be made available for Americans. 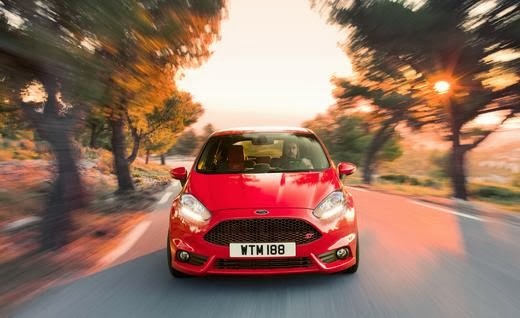 So what's the difference between the 2014 Ford Fiesta and the 2014 Ford Fiesta ST? Basically, the Ford Fiesta ST has a more powerful engine. This five-door 2014 ST will come with a 1.6-liter turbocharged four-cylinder engine that produces 197 hp at 6,000 rpm and 214 lb.-ft. of torque at 3,500 rpm. The transmission has six speeds and a clutch pedal, which will allow the vehicle to go from 0-60 in 6.9 seconds. As for fuel efficiency, the EPA hasn't been decided yet but is believed to be somewhere in the low 30s. Along with the more powerful engine, the ST comes with a trapezoidal grill with honeycomb mesh (designed to optimize cooling), rear diffuser, ST body kit, spoiler, 17" wheels, optional Recaro seats, ST leather wrapped steering wheel, ST gear shift knob, aluminum pedals, dual chrome tipped exhaust, fog lamps, automatic temp. control, push button start, and larger brakes with rear discs - wow! This beautiful 2014 Ford Fiesta ST that has arrived in the US will have a base price of $22,195. If you're interested in the 2014 Ford Fiesta ST, stop by our dealership today we can discuss all available discounts and rebates. If the Fiesta is not for you, we can help you into another great New Ford Car or one of our Certified Preowned Cars For Sale - so come see us today!